This first appeared as 1 of 7 top Canadian dividend ideas for September 2017 in the Seeking Alpha Marketplace service DGI Across North America. 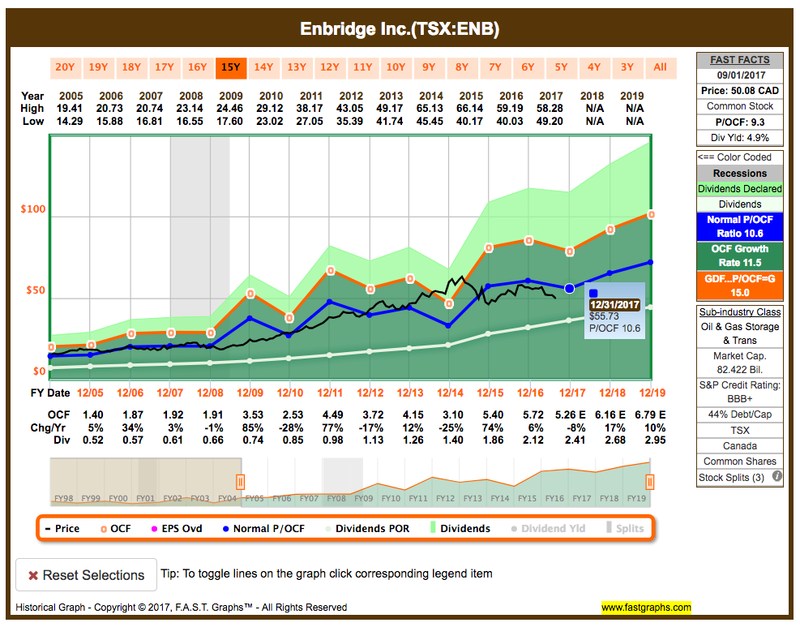 If you’re looking for one energy stock to invest in that “has it all”, it’d be Enbridge Inc. (TSX:ENB)(NYSE:ENB). As an energy infrastructure company, it is a safer investment than oil & gas producers. Moreover, it’s a leader in its space. Enbridge transports 28% of the crude oil produced in North America, including nearly 100 commodities or refined products. Enbridge also gathers, transports, processes, stores, and distributes natural gas. So, it plays a key role in North America’s transition from coal to cleaner energy — natural gas and renewable energy. Since 2002 the company has begun investing in renewable energy with a primary focus on wind generation. 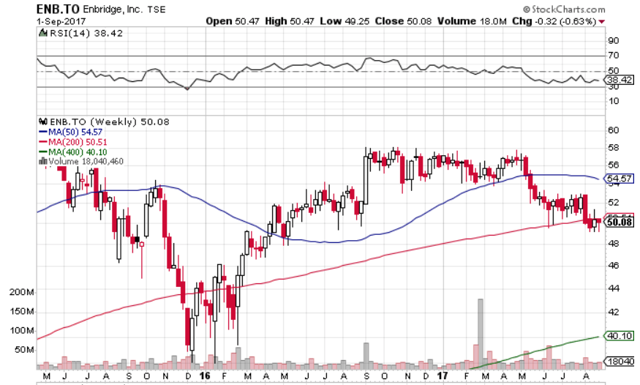 This entry was posted in Dividend Investing, Energy Stocks, Investing and tagged NYSE:ENB, TSX:ENB on September 14, 2017 by Passive Income Earner. This article first appeared in the Seeking Alpha Marketplace service DGI Across North America. Six dividend growth stocks from the energy infrastructure space are discussed. They offer yields of 4.6-7.5% and double-digit price appreciation potential in the near term. The energy infrastructure stocks have pulled back meaningfully due more or less to the lower commodity prices. These stocks are safer and less volatile than energy stocks, which have direct exposure to lower-priced commodities. For income investors, it is a good opportunity to consider the energy infrastructure stocks, which tend to grow their dividends over time. Enbridge is the biggest company with the largest scale. Here’s how the company looks like after combining with Spectra Energy Corp. If you’re looking for safety and strong dividend growth, Enbridge is your stock. Enbridge is ~15% below its 52-week high of ~C$59 per share and ~1.8% higher than its 52-week low of C$49.20 per share. Enbridge is a diversified business. It produces and processes natural gas, has a complex pipeline system that transports liquids and gas across North America, and generates power with wind, solar, and geothermal facilities. The company has increased its dividend per share (“DPS”) for 21 consecutive years. In the last 20 years, it has compounded its DPS by 11.2% per year. Through 2024, Enbridge expects to hike its DPS by 10-12% per year. Currently, it’s a good time to buy some shares at an attractive yield of ~4.9%. The street consensus at Thomson Reuters [TSX:TRI](NYSE:TRI) has a mean 12-month target of C$62.30 on the stock, which represents ~24% upside potential in the near term. F.A.S.T. Graphs also show that Enbridge is undervalued as a multi-year investment as its cash flow per share growth is estimated to grow at a double-digit rate in 2018 and 2019. This entry was posted in Dividend Ideas, Dividend Investing, Energy Stocks, Investing and tagged NYSE:ENB, NYSE:PBA, NYSE:TRP, TSX:ALA, TSX:ENB, TSX:IPL, TSX:KEY, TSX:PPL, TSX:TRP on September 5, 2017 by Passive Income Earner. Can Enbridge Inc.’s Dividend Attract You? Combined with the Q1 increase, the total 2017 dividend increase is anticipated to be 15%. This implies an annual payout of C$2.438 per share, or a forward yield of almost 4.4%. That’s an attractive yield compared to Enbridge’s historical yield range. This entry was posted in Dividend Ideas, Energy Stocks and tagged NYSE:ENB, TSX:ENB on February 28, 2017 by Passive Income Earner. The amount of dividends you receive is based on the number of shares you own in a company. So, for the long-term income portfolio, it makes sense to buy more shares in high quality companies on price dips.